Austrian teacher of religion at the Jewish school and the German gymnasium in Lemberg, where he was born in 1837; died Dec., 1899. He supported the Haskalah movement in Galicia and was a gifted Neo-Hebrew poet. 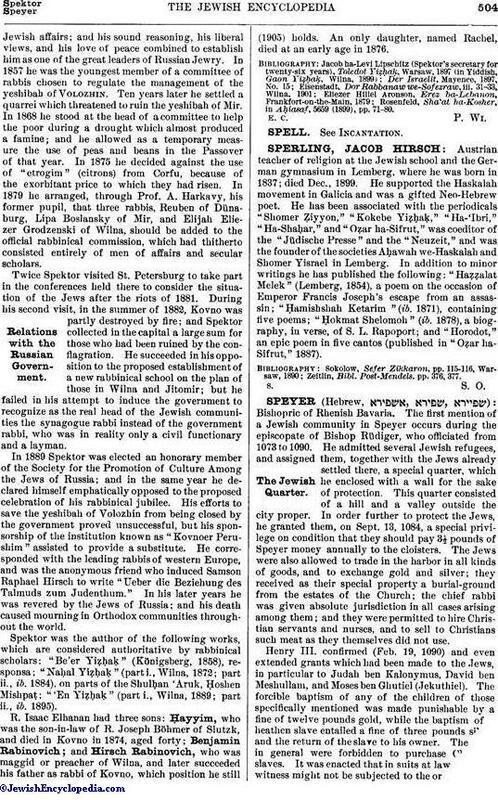 He has been associated with the periodicals "Shomer Ẓiyyon," "Kokebe Yiẓḥaḳ," "Ha-'Ibri," "Ha-Shaḥar," and "Oẓar ha-Sifrut," was coeditor of the "Jüdische Presse" and the "Neuzeit," and was the founder of the societies Aḥawah we-Haskalah and Shomer Yisrael in Lemberg. In addition to minor writings he has published the following: "Haẓẓalat Melek" (Lemberg, 1854), a poem on the occasion of Emperor Francis Joseph's escape from an assassin; "Ḥamishshah Ketarim" (ib. 1871), containing five poems; "Ḥokmat Shelomoh" (ib. 1878), a biography, in verse, of S. L. Rapoport; and "Horodot," an epic poem in five cantos (published in "Oẓar ha-Sifrut," 1887). Zeitlin, Bibl. Post-Mendels. pp. 376, 377.